Introduce yourself and tell me a little bit about yourself and how you got started in the hair care business. My name is Dwan White. My entry into the hair products industry came in 2000 when, as a consumer, I fell in love with a new hair product. After carefully exploring the label, I realized the manufacturer was located right in my city! I sent a short email (with my resume attached) to the President of the company letting him know, as both a consumer and marketing professional, how much I loved the products. That communication led to the President offering me an opportunity to become a consultant to the company. From there, I began a career as a Product Development consultant in the hair products industry, servicing that company and others, including House of Cheatham. I joined House of Cheatham full-time in 2008, creating new brands and products, specifically for women with textured hair. I'm now the Director of Global Marketing & Product Development at House of Cheatham. Let’s talk a bit about the line/products. Can you tell me about it, its ingredients etc.? We were careful to formulate Texture My Way with a well-balanced blend of natural and synthetic ingredients that are essential to help deliver long-lasting moisture, softness, manageability and shine. The extra virgin olive oil and shea butter in each formula helps to strengthen and soften hair. A couple of our products do contain small percentages of light weight silicones. We included them because they optimize the formula’s ability to retain moisture. We know that moisture retention is all-important to women with textured hair. The small amount of silicone included helps the hair to hold on to moisture much longer than it would without it. With our moisturizing products, you don’t have to reapply them throughout the day to get the moisture you need. Each therapy is completely free of sulfates, parabens, mineral oil and petrolatum. Who was your product line developed for? Do the products will work better or differently for certain hair types? Texture My Way was developed with style chameleons in mind — that segment of women with natural hair who enjoy switching up their style. They go from sporting bouncy curls or coils to wearing it flat-ironed, silky straight and other versatile looks in between. Manageability, shine and softness are important to them, as well as products that don’t weight their hair down or leave it feeling gummy or oily. We've also worked hard to keep our products affordable. Each one retails for just $6.99, making them perfect for curlies on any budget! How do your products work for curlies? What results can they expect? 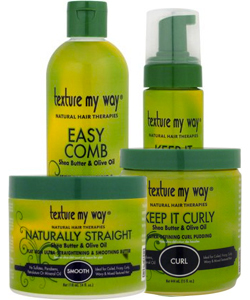 Texture My Way is ideal for curly hair. We get lots of great feedback on how the therapies keep hair moisturized, are light-weight, smell great, and provide the manageability and style control that 2A-4c hair needs. 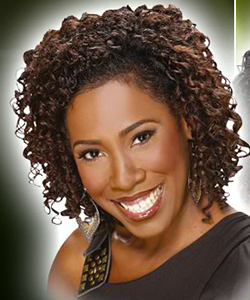 Do you have any tips for women who are considering going natural or new curlies? Patience is essential for women considering transitioning from chemically straightened to natural hair. Hair in transition goes through a learning curve. There’s always some trial and error, but training hair that has been chemically altered to become manageable without chemicals takes patience and the right maintenance. The “big chop” is the fastest way to dealing with the transition, but not every woman wants to take that plunge. Gradually cutting hair shorter helps, as well as opting for styles that are not super straight. Candy curls, spirals, roller sets…anything that gives hair body can effectively masquerade different textures. Texture My Way Naturally Straight Flat Iron Butter can be used to keep new growth flat and silky smooth, and Keep It Curly Styling Foam can give bounce to roller sets or twist outs. For growth, a healthy, clean scalp is the key. Texture My Way Hydrate! sulfate-free Shampoo gently and effectively cleans and nourishes hair and scalp. Do you have a "suggested style" or a "featured style" to use wear with these products? That’s entirely up to the style chameleon. There’s a Texture My Way therapy to assist with creating and maintaining natural styles, whether silky straight, springy coils, soft afros, deep waves or bouncy curls. Tell us where we can connect with your brand. You can connect to Texture My Way at www.texturemyway.com, on Facebook and Twitter. Independent owned, neighborhood beauty supply stores nationwide, and at CurlMart. Lastly, what’s your opinion on the texture revolution. Do they see it becoming a bigger trend/movement? We are happy to see women embracing their natural texture. This movement is self affirming and a great message for young girls about celebrating who they are, naturally. As styling techniques, products and social media evolve, so will the movement. Hollywood is still about creating illusions. While many celebs are fine with their natural texture in their personal lives, if their role calls for the illusion, then that’s what we’ll see in front of the camera.